Just thought I would take a moment to provide an update on how we got through the winter season of 2016/2017. As I updated previously, we now have our full occupancy permit, and while we still have a fair amount of jobs to do, to get the house “complete” (lots of trim, painting, etc), we are settling in nonetheless. I was also able to rig up our radiant heating in the basement, in a kind of rudimentary fashion (currently we can only control it manually, I still need to install some thermostats), but it did an excellent job of keeping the whole house cozy and warm. We currently have the radiant set up as five “zones” – the main living room, the utility room, the two bedrooms, and the storage room (which may one day become a bathroom), and we were able to stay comfortable with only the living room zone activated. Enabling other zones made the house ridiculously hot. 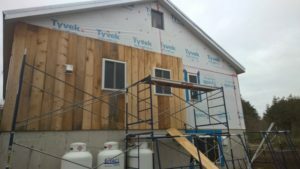 It is good to know our investment in insulation was worth the money spent and time invested. We really only needed the fireplaces on the coldest of days, to take the chill out of the air upstairs. In terms of new work completed, I have slowly been mudding the drywall upstairs, and we’ve got our master bathroom painted (nice to have at least one painted room in the house!) and will soon be painting the main bathroom / laundry room. I’ve also started framing in the walls in the basement to divide up the space into the various rooms. Even without drywall, it makes a big difference to define the space. That’s about all there is to report, so I’ll sign off and wish you all a happy spring! Recently, I have purchased an updated dash camera for my car, to replace my Blackvue DR-400HD. While the Blackvue served me well for several years, it finally developed an issue where it simply reboots repeatedly. I tried replacing the battery, and reloading the firmware, but sadly I was unable to recover it. 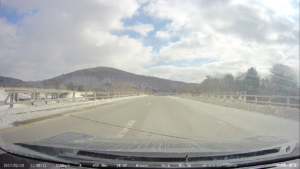 As it turns out, dash cameras have come a long way since 2012 when I purchased the Blackvue. At the time, the Blackvue was the best camera available – 1080p Full HD recording with GPS and parking mode, in a compact package. However, it did have some drawbacks. If you wanted to use the “parking mode” feature, it requires an additional box (the Power Magic Pro) to prevent the camera from draining your car battery. Also, it was designed with an internal battery; unfortunately over time and in extreme heat, the unit could overheat and produce corrupt video. 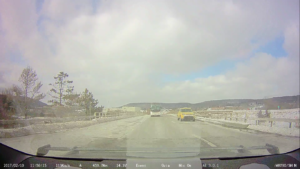 Newer dash cameras tend to use a super-capacitor in place of a battery, which tolerates temperature extremes much better than a battery-based unit. Enter the Qvia AR790WD: this camera was just released in late 2016, but has an impressive feature set. It has two cameras, front and rear, both of which are capable of Full HD 1080p recording at 30 frames per second. Both cameras use an excellent Sony Exmos sensor, which provide excellent day, and good night footage; the front camera uses the higher end Sony EXMOS IMX 322 sensor for unparalleled quality. The AR790WD also provides Wifi, GPS, and ADAS (Advanced Driver Assistance System), and includes a full-featured parking mode with built-in battery protection. Like many dashcams, the AR790WD, also has g-shock sensors to detect if your car has been hit or in an accident – in these cases, special “event” video segments are saved on the cameras memory card so they cannot be accidentally deleted or overwritten. The camera is fairly easy to install, the standard packaging includes a hardwiring cable, but I also added a cigarette adapter power cable to my order, so that I could fire it up right away. I’ve since installed the hardwire kit, tapping into two circuits in my cars fuse box – I used a couple Add-A-Fuses for this. This dashcam has battery voltage detection built in and will not drain your battery beyond a set point when hardwired, which is great for parking mode. Hardwiring requires connecting the camera to an always on fuse – I used the brake light fuse here – and a fuse that is only powered when the car is running, for this one I used the radio fuse. Once hardwired you can take advantage of parking mode, the camera will automatically switch between always recording and parking mode, which is very convenient. There is also a power switch on the camera itself, if you just want to turn it off.. I expect the biggest challenge most will have (and that’s not to say it is difficult work! ), is either connecting the hardwire kit, or running the power and rear camera cable neatly though the cabin, tucked away cleanly. Mounting both front and rear cameras is straightforward, and it is easy to reposition the cameras if you didn’t get it stuck exactly where you wanted, as the adhesive is a removable 3M product that can be stuck and removed several times. Physically, both the front and rear cameras are quite small, the front camera is largely hidden behind my mirror, and the rear camera does not negatively impact my view through the rear-view mirror, it is very small and is almost unnoticeable. The ADAS system includes three kinds of alerts – Lane Departure Warning, Front Collision Warning, and Forward Vehicle Start Alert. Lane Departure Warning seems like a good idea, to notify you if you are drifting out of our lane. However, it is not 100% reliable, and also, without connecting the turn signal to the camera, I get alerts from this every time I change lanes. Front Collision Warning alerts you if the car in front of you has stopped so that you will not rear-end them. Forward Vehicle Start Alert seems like only a feature the distracted driver or compulsive txter would love – it notifies you, if you are stopped and the car in front of you starts moving. I find all of these driving aids kind of annoying and will be turning them off now that I’ve experienced them. 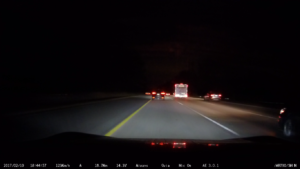 GPS is used by the dashcam to overlay speed onto the video. I believe the GPS positioning data is also stored encoded in the video files themselves, as an additional subtitle track, but I haven’t tried to extract this data yet to verify. I did like how my old Blackvue would just save the GPS data alongside the video files, but we should be able to extract out the gps data from the MP4 file if we need it. This dashcam provides a wifi connection that you can enable to manage the settings. Once enabled, you can connect to the wifi using an android or iOS device, run the Qvia App, and adjust all the camera settings as necessary. The footage produced by the Qvia is quite good, but I wouldn’t rate it as excellent. 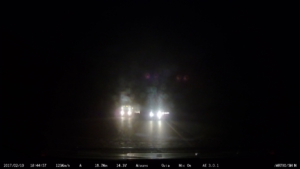 There are still some encoding artifacts in the recorded videos, and the rear camera nighttime recording are exceptionally dark, to the point they are probably not a lot of use. In bright sun, the rear camera also picks up a lot of interior reflections, I may have to try relocating the camera to see if I can mitigate this somewhat. Click any of the thumbnails below to view the recorded video. Overall I would rate the Qvia AR790WD as a great dashcam, if you are looking for a top quality, two channel dashcam with parking mode capabilities, this is definitely a camera to consider. The downside is the price – at $279USD, plus the cost of some microSD memory cards, this camera definitely comes at a premium. However, it is cheaper than the competition: a Thinkware F770 with an additional rear camera generally seems to cost more than that, as does a Blackvue DR650S, unless you can get it on Massdrop or another discount site. Today was a big day! Two years, five months, and exactly one week since we applied for our building permit (May 26th, 2014), we had our final house inspection with the building inspector, which we passed, and have now received our final approval for unconditional occupancy. This was a pretty monumental journey, with some really great times, but also some very difficult periods. Definitely a life-changing experience and something we will probably not get the opportunity to do again. While we do have our final approval for occupancy, that does not mean we are done by any stretch – it simple means we are done with the building inspector 😉 We still have a fair amount of trim and detail work to do, as well as finishing out the basement, but at least now we can take our time and do it all right and on our terms. Thanks for following along with our journey and if anyone wants to come for a visit to the homestead, by all means get in touch! We’ll be sure to post from time to time with updates as we make further progress. Next up – tiling and finishing our master bathroom 100%, including connecting our heated towel warmer and completing the installation of our freestanding tub! Yesterday morning it started snowing here, and it hasn’t stopped. I think it must have snowed more heavily during the night, as there is a fairly substantial amount of snow on the ground out there this morning…and there is no sign of it letting up. Watching the snow slowly covering the solar panels has reminded me that I have yet to adjust our panels to the steeper, 60-degree angle, which will help them shed the snow a bit more readily, and also collect a few more precious rays of sun (critical at this time of year.) I hadn’t gotten around to it yet as we have had what seems to be an unseasonably sunny fall, even through the beginning of November. 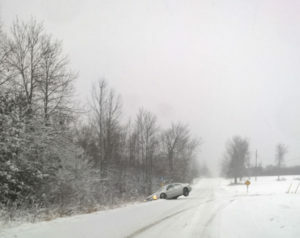 I was able to take a couple quick passes on our driveway with our new tractor-mounted snowblower, but when I left to drive to work, I didn’t get far before I found the first casualty of the storm. Perhaps today might be a better day to work from home! 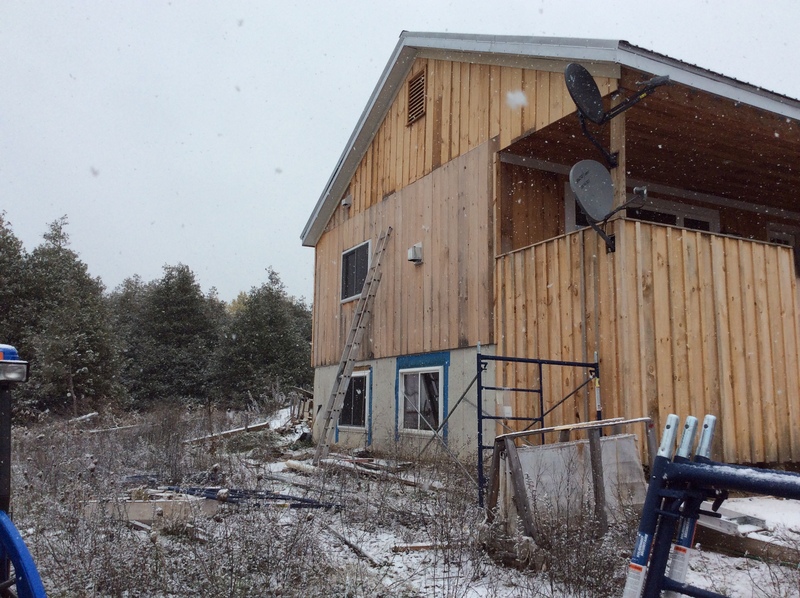 Today I managed to get the last of the siding installed – a big relief as it is getting colder out there! Even though this is complete, I’ll still have to finish off the putting up the trim around the windows, installing the battens, and staining / caulking. Thankfully I do not believe that is a requirement for our occupancy permit. Now I’ve just got to square a few more small things away and we can get the inspector back for final inspection! The picture says it all, really. 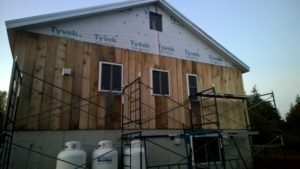 Today I got the scaffolding and planks set up to finish the second course of siding on the last wall. I was able to push myself and get passed the halfway point, and ended the day installing the gable end vent and the two soffit trim boards on the completed half. 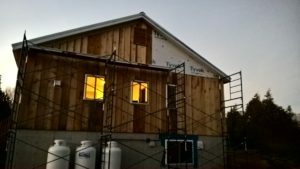 Sorry for the poor quality of the picture, it was 5pm and with the time change it was already getting quite dark (as you can see from the warm glow of the lights inside the house). There’s probably only another half days work to finish that siding off, then I will start installing the battens on that side of the house (since the scaffolding it already set up there) and install the window trim as well. We are getting very close to official “completion” (even though there are a ton of small details to finish off to make the house enjoyable to live in), which is really exciting. Another item off the list – thermal mixing valve! 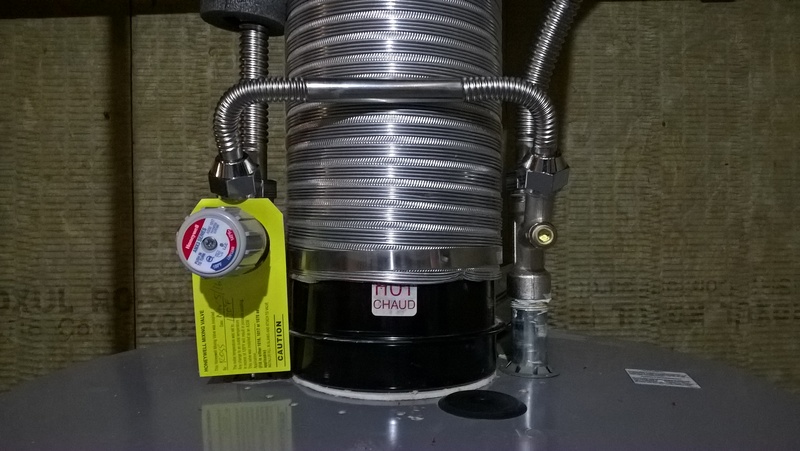 In an effort to complete all the items on the list the building inspector provided, to get our final occupancy certificate, yesterday I spent what ended up being far too long installing a thermal mixing valve on our domestic hot water tank. As part of new building code requirements, hot water heaters need to have a thermal mixing valve installed to prevent scalds at any hot water faucets in the house. Our shower valve already came with one of these built-in, but to comply with Ontario Building code you need one installed at the hot water heater. A hot water heater is typically set at 140F, to prevent legionella bacteria (cause of legionnaires’ disease), but 140F is a scald hazard. To prevent scalds, you install a thermal mixing valve – which mixes some cold water with the hot water coming out of the hot water heater, to regulate the temperature of the hot water to something more reasonable. I chose around 118F-120F, which is about the maximum it should be set to. Getting the mixing valve installed was quite the comedy of errors. 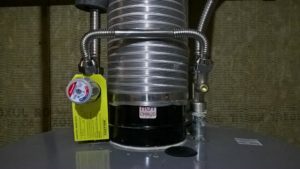 To install the valve, I had to remove that black connector (labeled HOT/CHAUD) section of the exhaust/flue system, so that I was able to screw on the cold and hot water portions of the mixing valve. Getting that off was a little tricky, and then once I got it off, I accidentally knocked my small flashlight down into the resulting hole, and it ended up at the bottom of the hot water heater on top of the gas heating element. *sigh* That one careless mistake meant I now had to remove the gas heating element, to retrieve the flashlight. You might think that might be fairly straightforward, which it was, but it was finicky, and an incredibly frustrating task getting it done. Thankfully, that is all behind us now, the mixing valve is installed and working, leak-free, so that is one more thing we can cross off the list. 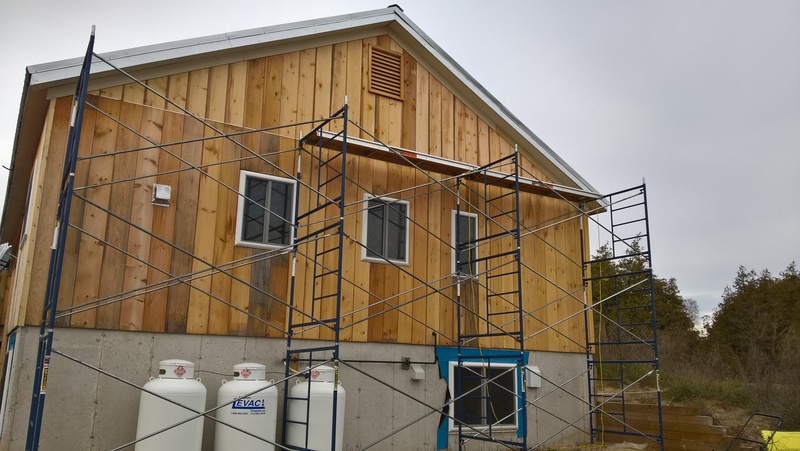 I am hoping to get back outside today and get more of the siding finished, so we can have it wrapped up before it’s truly miserable to work outside. Will post more soon!